Probably one of the largest subway systems in the world, the Paris Metro handles well over 4 million people per year over 16 lines. 2009 annual ridership reached 1.479 billion [source]. Each of these lines serve various destinations throughout Paris, with stations positioned quite close to each other, so its’ much easier to get around on the Metro than surface transit, though I also rode the bus system in Paris and found it quite efficient as well. If you’ve ridden the New York City Subway, or the Chicago “Elevated”, then using the Paris Metro is very similar to those systems. The Paris Metro opened in 1900 as part of the World’s Fair. Since that time, the Metro has grown to 16 lines that traverse much of the metro region of Paris. Most of the system was built using the “cut and cover” method following the various streets of the city. Therefore, some segments of each line can be rather curvy (see my blog post about Line 12 as an example). Click here to view a map of the system (from the RATP). Click here to view a wallet-sized map that you can easily print and take with you! (from the RATP). The 16 Metro lines are identified by number: 1, 2, 3, 3b, 4, 5, 6, 7, 7b, 8, 9, 10, 11, 12, 13, & 14. Note that 3b & 7b used to be part of mainline 3 and 7 respectively, but were later split into their own routes due to lower ridership. Line 14 is the newest and most modern of the lines, constructed during the 1990s (and opening in 1998). This particular line is about to undergo two simultaneous extensions; northward towards Saint Denis-Pleyel, and southward towards Orly Airport. Construction of of the first phase between Saint Lazarre and Mairie de Saint Ouen is underway, with the second phase from Saint Ouen to Saint Denis-Pleyel and the third phase from Olympiades to Orly Airport to commence at some point before 2019. These extensions are expected to be completed by 2025. Lines 1 & 14 are fully automated lines, meaning that there is no driver operating the trains (which helps out with labor costs and allows for normal operation of the lines during strikes). Although Line 14 was built as an automated line, Line 1 was actually converted to an automated system from a manually driven one. This process took place between 2007 and 2011, with the cascading of rolling stock taking place between April, 2011 and December, 2012. There are plans to automate other lines in the distant future – with conversion work on Line 4 already underway and Line 11 being next on the list (somewhere around 2025 to 2030) – but costs may prevent these projects from being carried out during the next 15 to 20 years. Although the global recession has put a damper on many expansion and modernization projects throughout Europe’s transport system, several key projects within the subway are moving forward. These projects include the dual extensions of Line 14 (mentioned above), as well as the southern extension of Line 4 towards Bagneux, and the northward extensions of Line 11 towards Rosny and Line 12 towards Aubervillers. Photo taken by HARTride 2012. 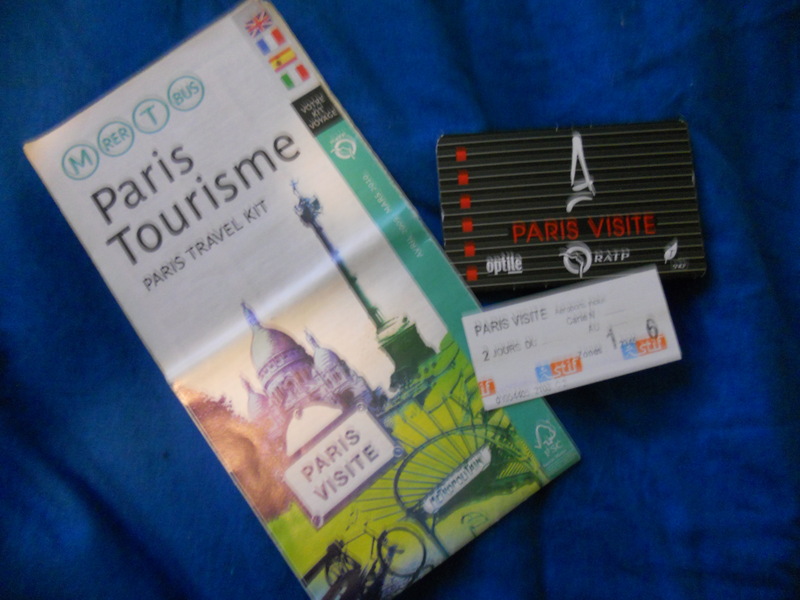 The above photo is that of the Paris Visite ticket, ticket sleeve, and RATP transit guide. During my trip in 2009, I quickly found out that a vast majority of self-service ticketing kiosks did not accept my US debit card. The reasoning for this was that US debit and credit cards do not posses a special chip that European credit and debit cards do, so they will not work at the kiosks located in each Metro station. Fortunately though, there are ATM machines that WILL take your American debit card, so I would suggest pulling out some Euro bills before riding the Metro, or any other transit system throughout Europe, unless that is, you pre-order tickets online. Some transit agencies now allow you to do that! Especially the high speed rail lines (like the TGV). As of 2016 – many US banks now have issued chip cards to their customers, so these have a better chance of working at self-service ticketing kiosks throughout Europe than cards that are not chipped. One of the best ways by far, to enjoy the Paris transit system if you happen to be just visiting for a few days is the Paris Visite pass. This pass allows for unrestricted access to the Paris transit system for up to five days. If you’re not planning to see what the suburbs have to offer (or maybe you’re limited on time), there are Paris Visite passes available for just the inner city (up to transit zone 3)*. Child ticket prices are also available if you are travelling with children. Though the cost may be a bit steep for some, the Paris Visite pass is really a great deal and well worth purchasing! Please visit the Paris Visite info page on the RATP website for the latest pricing list and regulations. For those wanting to plan ahead for their Parisian excursion, you can order your passes through the online interface and have them mailed to your home if you wish…regardless of where you live. Please be mindful that shipping rates do apply. Please visit the ticketing page on the RATP website to see other fare options, pricing, and regulations. If you have any questions, or see something that is incorrect, please drop me a line via the Contact Form.